Now that camp is over, it's time to grade my experience and reflect on the last 21 days! As I write this blog I've been back home for a day and have managed to take about four hot showers, had a pedicure and washed my hair. My point: I am writing this with a clear head. Overall, I give the camp a "B." I enjoyed the experience and think it's a great concept, although the process could use some serious upgrades. Before I embarked on this journey, I wrote down some expectations, and it's only right to share how my reality stacked up to them. Friendships: I've heard many criticisms of the non-relevance of the NYSC scheme. In my humble opinion, I would slightly disagree after going through it. Many of the youth in camp had never lived in Abuja and it was a great way to network, make new friends, and sort of ease our way into a new location. In my case, as a foreigner, I was able to relive (almost) what it would have been like to attend college in Nigeria. I am happy for the opportunity to start of my new life in Abuja with that experience behind me. Mami market: I must admit I was skeptical about the food situation. Normally a stickler for healthy eating, I doubted Mami market was Nigerian for "Whole Foods." But I must admit I did find my happy place with some of the cooks at camp. This section is dedicated to the Africa Man food stand where I ate most of my meals, which included indomie noodles (ramen), fried plantain (banana) and rice. To all the women who harassed me to buy grilled fish from them every night, thanks for the protein; to the frozen yogurt seller that kept me cool during the day, and to the fruit seller who kept asking me about being American (random), thanks for the natural glucose. 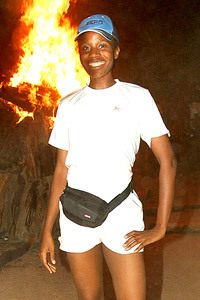 Mo Akiode hangs out by the bonfire at one of her final days at the Nigerian National Youth Service Corps camp. The internship scheme: In Nigeria, amongst a whole slew of problems, youth unemployment is a huge issue. The weight behind the NYSC process is to put graduates in a place of mandatory employment for an entire year. I have been posted, by request, to the national sports commission. Sounds like a great idea, though unfortunately most people don't get retained in their position after the year is up and find it hard to get another job. That is one aspect of the program the country must try harder to fix. OBS (Orientation Broadcast system):Thanks for keeping the entire campus upbeat with music, jokes, and up-to-date news. Sanitation and accommodations: It was as bad as I thought it would be, but apparently it could have been worse. I will never speak of it again! Power: I definitely didn't see that one coming. In Nigeria we have a power problem. The problem? There is hardly any power! Out of 21 days, I can remember five with manageable power. That meant, most other days, going to sleep with no light, waking up with no light, napping with no light! White: Oh my goodness, three weeks of being able to only wear white -- seeing thousands of people in white -- is enough to consider a pink wedding dress. Platoon duty: Every platoon was in charge of taking ownership of the camp for two days. This included cleaning the entire campsite, cooking, organizing the camp, etc. I always volunteered for sanitation, and it wasn't as bad as I thought it would be. Soldiers: I had my moments with the soldiers. I was beloved by them but not above punishment. I did get in trouble for wearing my hat backwards (I finally lost it and was happy to replace it with my ESPN hat), wearing flip flops instead of white sneakers (the weather can get above 100 degrees -- can you really blame me? ), and breaking curfew (I pleaded not guilty for not knowing the time curfew was, but apparently ignorance of the law doesn't work in camp, either). Half full vs. half empty: I would like to think I'm a glass half full type of girl. I chose to embrace the positives of this experience and minimize the negatives, and overall I am proud I finally got it done. I came! I saw! I conquered! It's been fun and thanks for following me through it. Time to get back to H4G, my grand purpose for being here.